Before I start this next blog post, I have a favor to ask of you. You might have noticed from my previous blog posts (sparse though they may be) that I am having the time of my life here in Austria. This has been the best three and a half months of my life, and I am so so so grateful to have been able to experience it. I have learned and grown so much, I have had some unbelievable experiences, and I have met incredible people whom I am very blessed to call my friends. But every day the clock ticks and my precious time here continues to slip away from me, like water through my fingers. Not a moments goes by that I don’t wish I could freeze-frame time or at least make it slow down. I try my best not to think about it because I simply can’t bear to. But it’s going to happen all the same; all good things must come to an end, and my Erasmus semester is no exception. So in preparation for the inevitable, I humbly ask you, my friend, to pray for me. Please. I don’t know how I am going to handle it or how I will be able to cope. It’s going to be one of the most difficult experiences of my life thus far, and I am really not looking forward to it. Even now I am crying as I write this. So please, friends, if you think of it, please pray for me. I am really going to need it. Thank you so much. Whew, enough of that for now. Let’s move on to happier things, shall we? We shall. One of my dear friends (official shout-out to Natalie Coleman) commented that I seem to travel more than I go to school. Well…. Yep. That’s definitely the case. Especially now. God bless Austria for being a Catholic country and for cancelling class on all religious holidays. And God bless Himself for having most of those religious holidays fall into the spring semester. As if the three-week Easter break were not enough, last Thursday was Ascension Day (in German “Himmelfahrt.” Yes, pronounced just like it looks. Jesus has a sense of humor.) Since I don’t have class ever on Wednesday or Friday, this meant that I had a five-day weekend. Woo hoo! :) So what’s an American girl to do when given a five-day weekend in a foreign country? Travel, of course! And travel I did! Early Wednesday morning, I took a train to Hallstatt, where I spent the day and night. On Thursday, I headed about ten minutes away to a town called Obertraun, where I saw some amazing ice caves. (They were sooooooooooo cool! Pun intended.) Then on Thursday evening, I went to Salzburg, where I met up with Jennifer Lawmaster (another official shout-out!). Here I must say that Jennifer, though she is technically from Norman, Oklahoma, is in actuality, a local Salzburgian (yes, I just made up that word). She studied abroad last spring at the University of Salzburg and LOVED it. In fact, she loved it so much that as soon as she got off the plane in Oklahoma last July, she started doing everything she could to come back. And it worked. She has an internship this summer at the U.S. Embassy in Vienna and has a Fulbright for the next school year to teach English in Bavaria (aka southern Germany). In other words, she is AMAZING and, to use a shamelessly American phrase, super legit. On Friday, we went to a small town called Berchtesgaden where Hitler’s Eagle’s Nest is located. Unfortunately, the weather was terrible; there was too much fog, so we weren’t able to go to the Eagle’s Nest; if we had gone, we wouldn’t have been able to see anything. Oh well, that’s just another reason for me to come back. But we went to Koenigssee instead; it’s like a fjord, and it’s soooooooooo beautiful. So that was way cool. On Friday evening, we went back to Salzburg (or Sbg, as Jennifer calls it), where we just happened to run into David Roos, my Swedish friend. I knew he and Anna (a Swedish girl and one of Jodie’s flat-mates) were coming to Salzburg, but I thought they get there until Saturday morning like Jodie. But they were there on Friday, and we just happened to find them. Cool, eh? That evening, we walked around the city (Fyi: the weather this weekend was terrible all over Europe, including Salzburg. As such, we started affectionately referring to Salzburg as “cold, rainy-burg.”) As we were walking around, we stumbled upon a huge pep rally/celebration in one of the main squares. The cause for celebration? Soccer, of course! (we are in Europe, after all). The Salzburg Red Bulls (named for Redbull, which has its world headquarters in Salzburg and is a huge sponsor of the soccer program there) had won some kind of championship. Friday evening was the official celebration with the team and all the fans. It was really fun to be there. Also, it reminded me of July 2006 when I was at the World Cup in Stuttgart. Good times, wonderful memories. :) After loudly cheering and singing a round of “Wir feiern die ganze Nacht” (translated: “we’re partying all night long.” It’s the most popular German party song. Youtube it and listen for yourself; it’s very catchy, and I bet you’ll love it to. ), we went to a hole in the wall pub. Literally, a hole in the wall. It was in a cave that during World War II was used by the Nazis as a radio station. And now it’s a pub. Pretty nifty, very strange. Oh, and I now have something in common with Tom Cruise (who’d a thunk?). He hung out there while he was shooting his newest film Knight and Day with Cameron Diaz in Salzburg. But don’t worry; I won’t be converting to scientology. Haha. On Saturday morning, Jodie arrived, and we spent most of the day doing—of course—“Sound of Music” sightseeing. Unfortunately, the famous living, musical hill is far out of town, so we didn’t get to go there, but, thanks to Jennifer, we were able to see most everything else, including, but not limited to: the Van Trapp house on the lake, the Abbey and the gate where the children come looking for Fraulein Maria, the cemetery (used as the model; the actual one was in Hollywood), and the church where the real-life Maria got married. Way cool. Then on Sunday, we got to visit all the museums in Salzburg for FREE. Sunday was the official “Day of the Museums” in Austria, so they were all free. :) Super duper. We checked out where Mozart was born, where he lived, and lots of other interesting historical places. All in all, it was quite a lovely weekend. Now, though, it is time to share one quick highlight from my travels. As I already mentioned, I spent Wednesday in Hallstatt, aka one of the most beautiful places I have ever seen. It’s on UNESCO’s world heritage site list, and with good reason. The town dates back to at least 800 AD when people started mining salt from the mountain behind it. (The town’s name literally means “city of salt”. Very creative). Nestled between the mountain and a huge lake, the town is breathtakingly beautiful; I couldn’t quit staring… or taking pictures. I think I took about 500 in Hallstatt alone. Haha. Anyway, I had wanted to visit Hallstatt ever since last semester when I took a study abroad prep class. For one of the assignments, I had to make a powerpoint presentation about the country where I would be going. 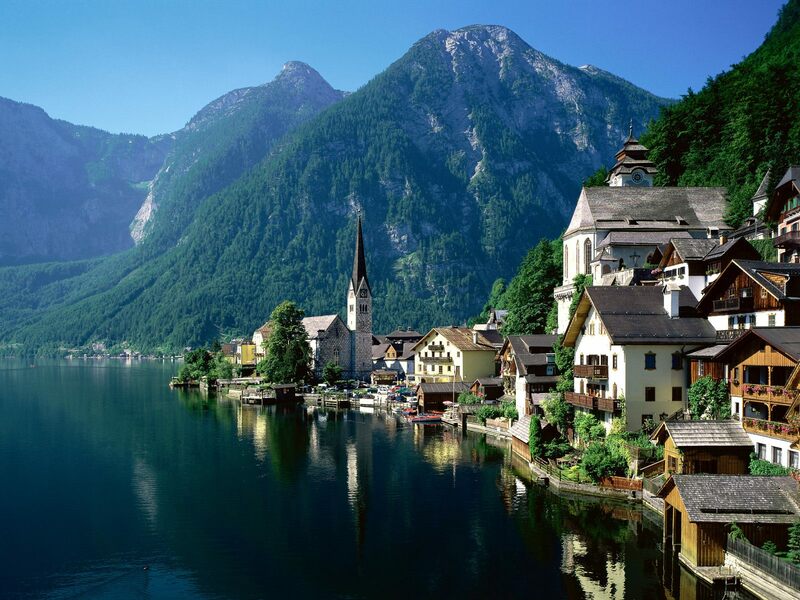 When I was looking for pictures of Austria, google images led me to Hallstatt. And it was love at first sight. So naturally, I had to see it for myself. Having done a bit of traveling, I have come to believe that adventures are best when shared. At the same time, however, it can also be good to take a day by oneself, to experience something on one’s own. My day in Hallstatt is the perfect example. As I already mentioned, I went to Hallstatt by myself… well, myself and Rick Steves, rather. (He’s the tour guide book, and he’s awesome! If ever you come to Europe, you HAVE to bring him along. It’s essential.) So Rick and I wandered around Hallstatt for a little bit, and in about 15 minutes, I had seen the entire town—twice. There isn’t much to DO in Hallstatt; it’s more about seeing it. So I enjoyed the view and took it in until 2 p.m. when the tourist office reopened after the lunch break. I knew I wanted to hike up the mountain/hill, but I wasn’t sure where to start and which path to take. The nice woman at the tourist center gladly helped me, and she gave me a map of the two main routes up to the salt mine at the top; she recommended that I visit the mine, so I decided I may as well. She also told me that there was one of the two routes was especially scenic. Now, if you know me at all, you probably have noticed that I am not the most directionally-gifted person in the world. Therefore, I managed to make the only possible wrong turn, therefore leading me up the less scenic route. That’s okay; it was still very pretty (Austria couldn’t be ugly if she tried. If I were one of the other countries, I’d have a serious inferiority complex.) I made it to the top, huffing and puffing my way along, getting to the mine just in time to take the next tour. (Side note: The tour was interesting enough, but the best part was getting to use the “horizontals” which is basically a miner’s version of sliding down a banister—a very loooooooong banister. And you get to go really fast because they make you wear scrubs with a special material on the backside, so you slide more easily. It was super fun; the eight-year-old in me definitely enjoyed it… and yelled “wheeeeeeeeeeeeeeeeee!” the entire way down. Heehee :) ). Anyway, after the tour, I looked at my map again and found the more scenic way down the mountain back to town. As I was walking, I started to sing some of my favorite worship songs, even translating some of them into German (or at least attempting to). The more scenic route was definitely more scenic. I think I stopped every five seconds to take a picture of the woods or of the perfectly serene lake below. When I was about two-thirds of the way down, it started to rain. Opening my umbrella (for once in my life, I was actually prepared for inclement weather), I spotted a single bench to the right of the path.) This bench was perfectly situated under a couple trees so that their branches had successfully blocked it from the rain thus far. Feeling rather tired and welcoming the chance for a brief break—with an unbelievable view—I decided to sit down. And as I sat, the strangest thing happened. I started talking out loud with God, but not just talking like I normally do; no, I mean really pouring my heart out to Him. I can’t speak for everyone, so correct me if I am wrong, but I think that every person, regardless of gender, social status, religion, nationality, or whatever, at some point questions why they are here. Is there a meaning not only to life, but specifically to my life? Is there some reason, some definite, specific, tangible reason that I exist? Why am I here? Why am I alive? And do I matter? Maybe I’m just weird, and maybe I am the only one who contemplates those things. If so, then disregard everything I have said and am about to say, because this doesn’t apply to you. But if you have ever pondered any of these questions, please keep reading. Anyway, these questions are ever-present with me, sometimes consciously and other times just in the back of my mind. On this particular day, though, and at this particular moment on an empty bench in a rainy forest overlooking Hallstatt, all of them decided to bombard me at once. Now, I am not a perfect person by any means, and I am certainly nowhere close to having the faith I need to have. I have my doubts many times, and I have questioned God before and wondered if what I believe is actually true. For some reason, though, that afternoon on the bench was different, as if suddenly my questions came with an unprecedented urgency, as if my very soul, the very core of my being was dying to know the answers. I HAD to know; I HAD to. I started crying as I asked them, over and over again. God, why am I here? God, why did you make me? Do you really care about my life? Do you really have a plan for me? God, why am I here? Over and over and over again. My heart was aching, burdened with an indescribable pain, waiting, hoping for, desperately needing an answer. Psalm 139 is one of my favorite Scriptures. When I went through a particularly ambitious Scripture-memorizing phase several years ago, Psalm 139 was one of the first passages I chose. Nowadays if I have trouble falling asleep at night (which is often the case), I quote this whole chapter in my mind, and it helps me drift to dreamland. Thus, since I already knew the chapter, it seems only natural that it would come to mind at that critical moment as I sat on the bench. But as I have already noted many a time, there are no coincidences; without question, God made me think of it. As I spoke those words, saying them over and over and over again, something incredible happened: I started to believe them, and it was as if God himself had spread a healing balm over my hurting, weeping soul, as if I went from being soaking wet with teeth chattering to being wrapped tight in the warmest, softest blanket in the world. In that moment, my heart understood the truth: God loves me. He made me. He knows everything about me. He is intimately involved in all the details of my life. Nothing can ever separate me from Him. Because He loves me. And guess what? He loves you too. Wherever you are, whatever you’ve done, and wherever you’ve been, those truths are the same for you. God made you. He cares about you. He is intimately involved in your life. And He desperately wants you to love Him back. My prayer is that you will experience this firsthand, like I did on the soggy park bench that day. Thanks so much for reading. God bless.